This is the second in a series about hand-crank, long point pencil sharpeners. The next long point pencil sharpener I bought last year was the Dahle 133. Mark Tucker of Write Analog recommended it to me on the Erasable Podcast Facebook group. I was discussing how I was looking for something better than the Mitsubishi KH-20 and that I had a few specifications: it had to be rubber tipped where it grips the pencil and the point had to be somewhat concave. When Mark threw the Dahle 133 my way, I thought there was no chance this would be the one, but the looks were deceiving. This is a great tool and far exceeded my expectations. 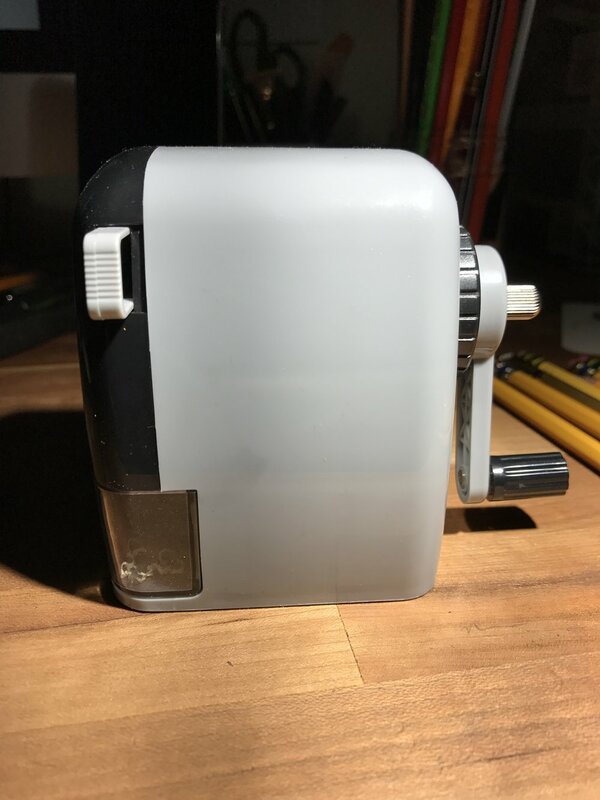 In my wrap-up I will be diving deeper into this, but I will say that the Dahle 133 is probably the most economical sharpener of all the ones I reviewed. It doesn't take as much off the pencil, partly because of that smaller collar, but you're not sharpening as much because the concave nature of the cut exposes more core. Where it differs from the Mitsubishi KH-20 is the infinite adjustability of the point length. The dial is basically a screw that moves the stopper in and out, and instead of having 2 choices like the KH-20, you can stop the dial at any time between the longest and the shortest point, so you can find what works best for you. Musgrave Harvest with shortest point setting. It has a plastic body and rubber tips on the pencil gripper. Unlike some, it only has a push button to retract and release the grips, as opposed to the "antennae" that sit atop the sharpener face. It is short, and probably the smallest of the group, which means it also has the smallest shavings holder of the bunch. And for a little guy, it is remarkably loud in comparison to the others tested. It only comes in one color, gray and black, but it is fairly inexpensive compared to others. 1. Short collar but long core exposure. 2. Adjustable point size, with many options. 3. Can sharpen jumbo and odd-size / shape pencils. 5. Doesn't leave a needle point that just snaps the second it hits the page. 2. Small body means small shavings drawer. 3. It rattles when you sharpen as if the fitting is loose, but it isn't. 4. The included desk clamp isn't very long, so it may not fit a thicker desk top. 5. The shavings build up towards the back of the tray, so they sometimes get everywhere if it's only even half full when you empty it. Come by tomorrow for a review of the Derwent Long Point sharpener.